All bets are off at a corrupt intergalactic fighting competition where a system removes the fighter’s advantage, no matter what species and puts them on an even standing. Made and released in the UK in 1989, like Robot Jox, Crash & Burn, Oblivion and other Charles Band productions the lack of money is obvious but this B-film captures the imagination which many larger budgeted films fail to do. 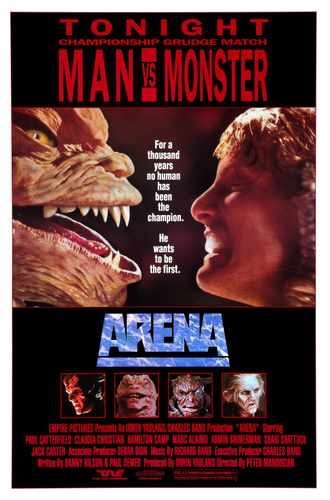 Arena taps into a time when fighting films had peaked and Rocky was deep rooted in the conciseness along with WWF specials. Director Peter Manoogian offers plenty of showdowns. His direction is fine and many of the makeup and special effects still hold up. In a cast of outlandish aliens Claudia Christian features as Quinn and the Christopher Reeve-a-like Paul Satterfield’s Steve Armstrong works as the stereotype hero. Despite its clichés and the fact it was never going to win any Oscars its many references to other science fictions and fresh concept makes it an enjoyable low budget science fiction.